The gas giant Jupiter is the largest planet in our solar system. No seriously, it's enormous - mind-bogglingly big*. But we don't know that much about it compared to our other celestial cousins like Saturn and Mars. Now that's about to change, thanks to a new probe called Juno that's just arrived at the planet. 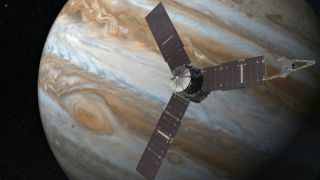 Nasa has sent a few missions to Jupiter over the years - the most notable of which was Galileo, which orbited the gas giant from 1995 until it was (intentionally) crushed by Jupiter's thick atmosphere in 2003 after running out of fuel. Galileo took photos of the planet, and recorded a lot of data about its atmosphere, magnetic field and moons. It also discovered a faint ring system around the planet. Juno was launched to replace Galileo in 2011, and has spent the last five years hurtling through space on its way to the Jovian system. It carries a much richer complement of scientific instruments than Galileo did, thanks to technological developments over the past few decades. Its goal is to hunt for clues on how Jupiter formed, whether it contains a rocky core below its thick atmosphere, how much water it contains and more. But before it can start to do all that it had to get to Jupiter in the first place, and that wasn't easy. On the contrary, Scott Bolton, principle investigator of the Juno mission, described it as "the hardest thing Nasa has ever done". The spacecraft had to dodge and weave past Jupiter's radiation belt and its rings of dust, skimming the planet's atmosphere in the process. But at 3.18am GMT on 5 July, it arrived in a safe orbit and oriented its solar panels towards the Sun (it's the furthest solar-powered spacecraft from Earth). "Juno, welcome to Jupiter," said mission control commentator Jennifer Delavan as Nasa staff cheered and hugged. Later on, at a press conference, the spacecraft's project manager Diane Brown added: "It's overwhelming. The risks that were overcome, it's amazing. The more you know about the mission the more you know about how tricky it was. To know we can go to bed tonight not worrying about what is going to happen tomorrow, is just amazing." The spacecraft begins in a 53-day orbit around the planet's poles, but by October 14 it will have dropped to a tighter 14-day orbit. The first close-up images of the planet should arrive in late August, as it starts to swoop inward with its cameras on. Its lifetime, however, will only be about 20 months - despite having much of its electronics locked inside a titanium vault (along with three Lego minifigs), Jupiter's intense radiation field will slowly cook the spacecraft. In February 2018, after completing 37 full orbits, the spacecraft will be commanded to descend into the planet's atmosphere (just as Galileo did) and never be seen again. Oh, and in case you're wondering why it's called Juno, that was the name of the Roman god Jupiter's wife. In Roman mythology, Juno was able to pierce the veil of cloud that Jupiter had drawn around himself to hide his shenanigans with his mistresses (which the planet Jupiter's moons are named after). Who says scientists don't have a sense of humour? *If you haven't seen this terrifying video of what different planets would look like if they were orbiting Earth at the same distance as the Moon, you should do so immediately.